I would have scarcely imagined a week ago that a movie about a snail wanting to win the Indianapolis 500 could possibly be my favorite animated film of the year so far, but there it is. Turbo and it’s titular escargot have won me over using a combination of fearless silliness and well-executed humor. Turbo (Ryan Reynolds) is a normal garden snail…well normal except that he is obsessed with speed and Indy car racing, especially French-Canadian racer Guy Gagne (Bill Hader). His brother Chet (Paul Giamatti) tries to protect him, despite Turbo’s status as an outcast. A series of accidents and an overdose of nitrous oxide grant Turbo super speed, and he is soon discovered by (human) Tito (Michael Peña), a taco truck driver. 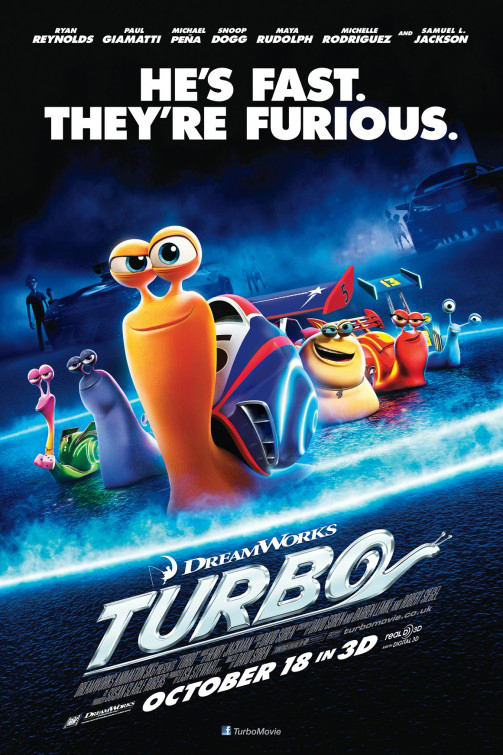 Turbo is entered in a snail racing league, where he meets Whiplash (Samuel L. Jackson), and his crew, voiced by Snoop Dogg, Maya Rudolph, and others. Other voices you’ll recognize are Michelle Rodriguez, Luis Guzmán, and Ken Jeong. Writers David Soren (also the film’s director), Robert Siegel, and Darren Lemke run with the goofiness of the premise, and that tends to drive most of the film’s spot-on humor. It might be odd to talk about comedic timing in a film where the voices were likely recorded at different times, but the animators have a great handle on the comedy beats. I laughed heartily several times while watching the film, and Turbo is the funniest movie of the year so far after This Is the End. Turbo also takes kind of an interesting approach to animation. Any sentient creature, be they human or mollusk, is rendered in a cartoonish style we have come to expect from the DreamWorks house. However, perhaps because of the contemporary setting, anything that doesn’t fit that description (even crows) are depicted in a photorealistic style. While one might guess that this would be jarring, it actually works quite well, and the scenes taking place in the garden and the race track are equally lush and gorgeous to behold. Even as I finish this review, I still can’t believe I am praising this movie so highly. It is easily the most unexpectedly fun movie of the year so far for me, and it is the kind of film kids and adults will equally enjoy. I highly recommend it. Turbo opens today in Philly area theaters.